December 2018, Ronkonkoma, NY – Mercer Culinary® will be featuring over 200 new and innovative products at The NAFEM Show 2019. Contemporary knife boards made from elegant leaflet acacia wood and complementary satin finish stainless steel base to enhance any décor. Knives are held in place with strong magnets and are easily accessible from the angled stand. Stylish magnetic knife bars provide a sleek and attractive way to store cutlery, turners, and other kitchen tools. Constructed from heavy-duty stainless steel with strong magnets, the dual bars offer greater holding power. The satin finish hides wear and is suitable for any kitchen. Trend Plating – Mercer’s most popular plating spoons and tongs in attractive matte black and rose gold finishes. These elegant and sleek tools are designed for the professional who is looking to up their personal style. Y peelers – constructed with an incredibly sharp carbon steel blade, now available in six different colors. Four uniquely different bar/utility knives, offering incredible flexibility and functionality for a variety of tasks. These knives include a blade sheath for safe storage. Two fish bone tweezers – manufactured to exacting precision for effortless removal of the finest pin bones. In addition, Barfly® Mixology Gear will make its NAFEM debut featuring brand new products and finishes. Barfly is created for the discerning mixologist who crafts innovative and creative cocktails. These professionals require a line of tools which delivers excellent performance, consistent accuracy, and looks great on the bar. Barfly is designed to meet all of those demands. 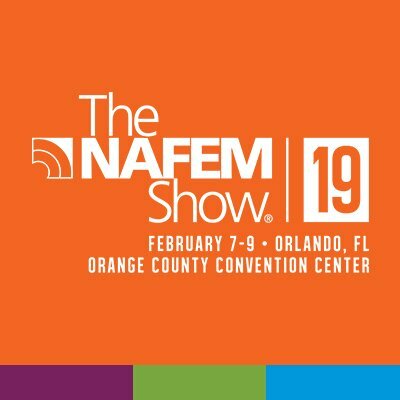 The NAFEM Show takes place February 7-9, 2019 at Orange County Convention Center, Orlando, Florida, Chicago, IL. We invite you to stop by Mercer Culinary booth #2057 and learn about why our diverse product line makes Mercer Culinary your choice for cutlery, tools, apparel, accessories and barware. Take a brief tour of our booth and receive a gift. If you are unable to attend the show, visit www.mercerculinary.com or www.barflybymercer.com, or contact Mercer Culinary, 1-800-221-5202 or sales@mercerculinary.com for more information. Mercer Culinary manufactures and supplies cutlery and accessories for the professional culinary market. Exceptional materials, unique design and dedicated craftsmanship are the hallmark of Mercer products. Mercer is the predominant supplier to culinary education with a strong presence in commercial foodservice spanning more than 30 years. Quality, performance, value, and service are the focal points for this second generation family business.